Tracey Panek, historian at Levi Strauss & Co.
Tracey Panek knows history and the tools that you use in determining provenance. Before joining Levi Strauss & Co., Panek spent 14 years in the automotive industry as historian and archivist at AAA Northern California, Nevada & Utah. In 2014, she was appointed historian for fellow San Francisco firm Levi Strauss & Co., shifting her focus from cars to clothes – which she enjoys because of the personal connection that people have with it. 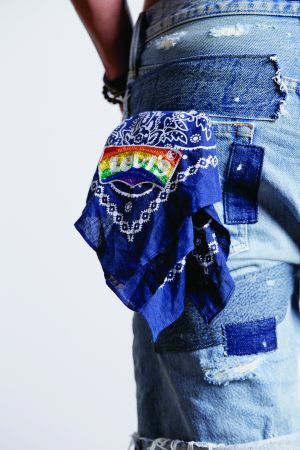 Since then, the power woman has not only guided top designers, famed museum directors and rap superstars through the vast Levi’s archive with pieces dating back to the 1870s, but she is also an attentive observer of historical Levi’s pieces worldwide, popping up on Ebay, Christie’s or just your corner thrift shop. We spoke to Panek about her latest finds, the evolution of the blue jean image and 50-year-long trend cycles. Spending your time in an archive filled with centuries of denim history sounds like a dream job to us. What is your daily job routine like? Every day is a little bit different but the main parts of my job are working with executives and other employees of the company, answering questions about our development and origins. I am working especially close with the designers. They come in and take a look at different pieces or early ads to get inspiration for new products, such as the recently introduced 505C or 501 Skinny variants. We also often host VIPs and journalists at the archive. More recent highlights were visits by Geoffrey March, one of the directors of London’s Victoria & Albert museum (who I have to say that of the visitors that I host, we spent the most time just chatting), Off-White designer Virgil Abloh or Snoop Dogg. None of them is too cool to wear our white gloves when taking a look at the archive pieces! We have pieces that go back to our oldest blue jean in 1879 but we are always looking for editions, especially pieces which show particular use for how people have worn it. So my job is also about keeping an eye on what comes up and available so that if there are pieces that we need to acquire, we do that. Tell us about some of your newest acquirements for the archive. For example when I was in London last year, bringing over pieces that were shown in the V&A, it turned out that Christie’s was selling an Albert Einstein Levi’s leather jacket from the 1930s, so I went to the auction–with a racing heart–and luckily placed the winning bid so the jacket was delivered to San Francisco. Photo: Levi Strauss & Co.
Or last fall, I successfully bid on a pair of Steve Jobs’ jeans auctioned by Los Angeles-based Julien’s–by phone. Jobs was a well-known 501 fan and the pair that we acquired, probably from the mid-80s, even includes buttons that he sew in himself to wear it with suspenders. In other cases, we buy up pieces by individuals directly. Like this pair of customized 505 jeans that was actually in the Halloween bin at a Goodwill thrift shop. But then the shop assistant found out it was vintage because the red tab on its back pocket showed a Levi’s branding with a capital “E”–for all of our products today, we use a small “e”. So I got in touch with the manager at Goodwill and figured out a price. But unfortunately there are also cases where we don’t come to an agreement with the owners–like in the case of a pair of Lady Levi’s worn by Marilyn Monroe that I would love to acquire. When did the image of jeans change from cowboys to youth culture? In the 1950s, Levi’s 501 and leather jackets pretty much became the youngsters’ rebel uniform. This is what you would have seen Marlon Brando wear in the movie The Wild One, where he’s the head of a motorcycle gang which is terrorizing a community. The movie was based on a true incident and so many people were genuinely afraid of this kind of a character. Some schools even banned students from wearing their blue jeans because of this association! That was kind of the prelude to what would happen in the ‘60s. In 1967, the summer of love, we introduced our 505 blue jean, which was to many extends our coming-of-age-jean: it was made from pre-shrunk denim, it featured a zipper for the first time and it came in a much slimmer silhouette than the 501. It was also when, instead of calling them “overalls”, we started using the term “jeans”–because that was what young people used to call them. Also, instead of focusing on rodeos and cowboys (an images that we had been using since the 1930s), in the 505 ads, we showed a teenager and a modern looking blue jean to remain relevant. We also started radio and TV adverts and worked with musicians such as the San Francisco band Jefferson Airplane who recorded one of our first radio adverts to connect to the younger generation. And it worked: In the 60s, blue jeans came to embody the idea of youthful rebellion and freedom. Customized Levi's in last year's V&A exhibition "You Say You Want a Revolution? Records and Rebels 1966-1970"
The 501 is currently experiencing a great comeback in streetstyle. Did you see that coming? How quickly do denim trends come back? Well, there is certainly a cycle. Looking back on it, you can say it’s kind of 50 years - it is interesting to look back on what was done 50 years ago. Like in the ‘60s, the idea of customization is super popular right now. Some things you can anticipate and some just evolve naturally. What do you think of premium and designer denim? That is certainly a different look. For us, it’s always been about staying democratic and authentic to our tradition which is creating the original blue jean. With our product we continue to look for inspiration in our roots and updating them.